"STAR WARS EPISODE I: THE PHANTOM MENACE"
"Star Wars" movies are classics because of how well they play on video. There's no reason to suspect "Phantom Menace" will be any different. But let's face it: The more thatrical the experience, the better. Letterbox, big screen, surround sound - if you can swing it. ('83) "Return of the Jedi"
('02) "Attack of the Clones"
('05) "Revenge of the Sith"
2) A colossal infantry battle between amphibious Gungan warriors and a vast army of battle droids on the wide, green plains of garden planet Naboo -- all the more remarkable for having been created entirely with computer animation. 3) The climactic, best-ever, light saber duel (which, naturally, takes place on an unrailed walkway atop a gaping architectural chasm) that pits heroic Jedi knights Obi-Wan Kenobi (Ewan McGregor) and Qui-Gon Jinn (Liam Neeson) against the demonic, dual-sabered and uber-gymnastic Darth Maul (Ray Park). In fact, even though "Phantom Menace" takes a Tatooine summer to get warmed up and is a bit of a yawner even in the home stretch, as soon as the credits rolled, I started my personal countdown to "Episode II" -- only 1099 days to go! So what's feh? Oh, where to begin? How about this: The Force, it is revealed, works through some kind of sentient bacteria that can be measured in the blood stream to indicate just how much of it is "with you." How lame is that? But make no mistake, this is exactly what George Lucas had in mind -- his vision has been brought forth to the letter in this first of three saga prequels that recounts a time some 30 years before "Star Wars," when Jedi knights still enforced an utopian peace in a galactic alliance far, far away. But as the story opens all is not well. An ancient, destructive clan called the Dark Lords of Sith have resurfaced after a millennium (where they'd been is not explained) and are laying the groundwork for what will eventually become the evil Empire. 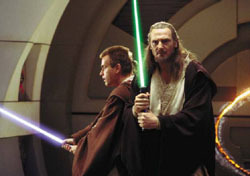 Allied with the greedy Trade Federation, they orchestrate a blockade of peaceful Naboo, and the Alliance dispatches our two Jedis to resolve the conflict. But they quickly realize the insidious Federation means to invade, and set about engineering the escape of the young Queen Amidala (Natalie Portman). 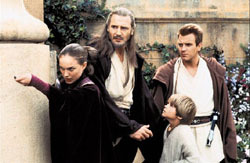 When their ship is damaged in battle during the evacuation, they make an emergency landing on Tatooine, where the plot trudges along for about an hour while Qui-Gon begins to get an inkling that a young slave boy named Anakin might be the Chosen One "to bring balance to the Force" (the story of his immaculate conception takes the Christ symbolism to a ridiculous extreme). Neeson, McGregor and especially Portman come off with an impressive amount of dignity considering not a one of their characters has any depth, and "Phantom Menace" is, sadly, plagued by formulaic follies. The dialogue (which has never been a strong point in this franchise) is often the cheapest of sci-fi rendered mythological tripe. More than half the speaking roles go to a Lewis Carroll/Jim Henson menagerie of gimmicky, computer-generated creatures -- the most annoying of which is a Gungan named Jar Jar Binks, a plush toy-conscious, CGI sidekick who is almost as grating as Chris Tucker's extra-femme DJ in "The Fifth Element." Actually, "Phantom Menace" has a lot in common with "The Fifth Element" -- both are over-produced, effects-heavy, mythology-based ego vehicles for writer-directors with comic book minds. And while Lucas' original "Star Wars" trilogy transcended science fiction to become among the most beloved movies of all time, "Fifth" and "Phantom" are both hole-riddled light entertainment -- fun and visually spectacular, but too silly to be taken as seriously as the directors clearly intended. Truth be told, I could catalog dozens of glaringly dumb problems with "Phantom Menace" (not the least of which is that Lucas assumes a working knowledge of "Star Wars" mythology). But still, you have to see it, don't you? I know I did, and I'm glad I did. But I can honestly say I was never really entertained.